Tom Clancy's Ghost Recon: Future Soldier is a third-person tactical shooter video game developed and published by Ubisoft for the PlayStation 3, Xbox 360 and Microsoft Windows. It was released in May and June 2012. Tom Clancy's Ghost Recon: Future Soldier was announced to be in development by Ubisoft on January 22, 2009. The game has a futuristic take on the Ghost Recon series. The campaign has settings such as Nigeria, Pakistan, Russia, and Norway. Kozak uses a drone to scout out enemies in the Pakistan streets. Here the screen is gray to show the perspective of the streets from the UAV camera. The game is a third-person cover-based shooter. Pulling the left trigger causes the over-the-shoulder view to zoom in, allowing for more precise aiming. Clicking on the right analog stick causes the game to switch to a first-person camera, which lets the player look down the iron sights. Some cover can be partially destroyed, forcing players to seek other hiding spots. While taking cover, players can be suppressed by machine gun fire, which takes the effect of narrowing and shaking the player's field of vision, making it harder to return fire. A new feature in the series is adaptive camouflage, which allows the Ghosts to become partially invisible. In the game, it is explained that the processing power doesn't exist yet for the camouflage to keep up with quick movements, so it is only active when the player moves slowly. It's enabled automatically when the player crouches, and disengages when running, firing or taking damage. During firefights, the player can prioritize up to four targets by marking them, on which squad members will focus fire. Outside of firefights, marking targets prepares for a synchronized takedown, so long as the enemy is still unaware of the team's presence. This mechanic is referred to by the game as "Sync Shot". The player is shown icons signifying when the squad mates have moved into position and taken aim on marked targets. If the player marks up to three targets, the player can either order them to fire, or take aim himself on one of the targets and fire, at which point the squad mates fire simultaneously. If the player marks four targets, the player must aim at one of the targets and fire in order to take down all four targets. Sync Shot also happens to be the only squad command in this game. Gunsmith allows extensive customizations of weapons, whereafter the player can test them on a firing range before entering a mission. Parts that can be customized include: optics, triggers, magazines, under-barrel attachments (e.g. foregrip or bipod), side-rail attachments (e.g. aiming laser), gas systems (standard, "over-gassed" for increased fire rate/lower accuracy, or "under-gassed" for decreased fire rate/higher accuracy), barrels, muzzles, stocks and paint (cosmetic only). In single-player, advanced parts are unlocked by completing missions and in-mission achievements (called "challenges"). In multiplayer, players unlock weapons and earn credits as they advance the level of their character. On the Xbox 360, players can use Kinect to customize their weapons through hand gestures and voice commands. Players have use of drones that can be launched covertly and controlled remotely, hovering or moving over the playing field for a limited distance. The player can leave the drone hovering in the air indefinitely, so long as it is not spotted by the enemy, and switch between normal view and the drone camera view. The player can also order the drone to return. Drones can be spotted by enemies and shot, and if they take enough damage, they must be recalled for repair, which occurs automatically after a short period. The drone has a camera to provide an aerial view. Targets can be marked from the drone view. The drone can also be landed on the ground, at which point it maneuvers on wheels, has its own active camouflage, and a sonic blast that can be activated to disorient enemies. Another automated element is the War Hound, used only in one single-player mission, which is a heavy walking robot, similar to BigDog, which can be controlled by the player and fires mortar rounds and TV-guided missiles. It can be used as portable cover. The game has various multiplayer modes, including cooperative and competitive game types. Tom Clancy's Ghost Recon: Future Soldier features a fully cooperative campaign, as well as a new survival wave-based mode called Guerilla, which is also playable as a single-player mode. Also featured is competitive multiplayer, with the game types Conflict, Decoy, Saboteur, and Siege and characters-Scout, Engineer and Rifleman. A code is used for full-access online play, and is a one-time use code. Used copies of the game will not have full access to online play. There are three downloadable content (DLC) packs that have been released: Arctic Strike, Raven Strike and Khyber Strike. The game opens in the year 2024 with a four-Man Ghost Recon team call-signed Predator, led by Joe Ramirez, deployed in Nicaragua to disrupt weapons trafficking in the region. Upon inspection of the convoy vehicles, a dirty bomb is remotely detonated, killing the team. Investigating the cause and tracking down the source of the bomb is tasked to another Ghost team call-signed Hunter, consisting of Ghost Leader Captain Cedric Ferguson, Staff Sergeant John Kozak, Master Sergeant Robert "Pepper" Bonifacio, and Sergeant First Class Jimmy "30K" Ellison. The team ships out from Fort Bragg, North Carolina under the supervision of Major Scott Mitchell. Mitchell informs the team of their new mission to rescue an arms dealer named Paez in Sucre, Bolivia who has information about where the bomb came from. Hunter rescues Paez and then proceeds to follow the trail of weapons: First, to a refugee camp in Western Province, Zambia, where they eliminate local warlord Dede Macaba; to Nigeria, where they rescue CIA SAD agent Daniel Sykes from private military company Watchgate; to Peshawar, Pakistan, where they capture Russian arms dealer Katya Prugova; to the Kola Peninsula in Russia, where the team destroys an arms cache at a remote Arctic base; and finally to an airfield in Kaliningrad, where they intercept and destroy a missile guidance system, causing an international incident. Some time later, a nuclear missile fired from Russia impacts London, but the nuclear warhead is eliminated at the last minute by the American missile shield. The launch is traced to Dagestan and is believed to be the work of a rogue Russian special operations group known as Raven's Rock, of which Prugova was an associate, with ties to ultranationalist political elements in Russia. Hunter is ordered into Dagestan to rescue a Georgian Special Forces squad who went to investigate the launch site. During the rescue operation, the team is ambushed by Russian Spetsnaz that have access to high-tech equipment on the same level as the Ghosts, and it is later revealed that these soldiers are part of Russia's elite "Bodark" (werewolf) unit, which have sided with Raven's Rock. A coup has been staged and Raven's Rock is now in charge of the majority of Russia with a few loyalist Russian forces opposing the new government scattered around the country. Hunter heads to northern Russia to secure some drilling ships so that the loyalist Russian forces can have a steady flow of oil. After accomplishing this, the team is assigned to rescue a loyalist general who is seen as the leader of the resistance. After destroying the artillery that was attacking the General's forces, the team is pinned down by overwhelming Russian forces, until air support arrives and eliminate all opposition. Kozak is then tasked with a solo operation to rescue deposed Russian President Volodin from a prison in Siberia. Kozak is successful, and then Hunter protects President Volodin in his return to Moscow, and eliminates the Raven's Rock General who was coordinating the city's defense. The Raven's Rock forces are overthrown and the crisis ends. While everyone else is celebrating, Major Mitchell gives Hunter intelligence on the location of the seven other leaders of Raven's Rock, which orchestrated the whole crisis. The team is sent in on a clandestine operation to eliminate the seven. After eliminating six of the seven, the team chases the last member, code-named "Ace", to a train station, where they wound him. The wounded Ace taunts the team that they will not kill him because the American government will stop them. Major Mitchell radios Hunter ordering them to stand down, stating that Ace is to be taken alive and brought back to United States, that the orders came "from the top", and that they are "not to touch" Ace. At that point a train comes, and Ace, who is wounded on the tracks, calls for the team to save him, reminding them that their orders were to keep him alive. Ferguson corrects him while Hunter leaves the area, saying that their orders were not to touch him, making Ace's death look like a train accident. In December 2009, "Tom Clancy's Ghost Recon: Future Soldier" was trademarked by Ubisoft, raising speculation that this could be the name for the upcoming Ghost Recon 4. This was subsequently confirmed by an official announcement. The release of Tom Clancy's Ghost Recon: Future Soldier was initially targeted for the 2009–2010 fiscal year; publication was delayed to the 2010–2011 fiscal year, and then to the "March quarter of 2011" in May 2010, and then to the April 2011 – March 2012 fiscal period. The PC version was officially declared as cancelled in December 2011 and replaced by Ghost Recon Online, citing piracy as the main reason. However, on January 10, 2012, the PC version was officially re-announced as being in development along with its console counterparts. On April 19, 2012, a closed multiplayer beta for the PlayStation 3 and Xbox 360 was made available to those who have pre-ordered the game from GameStop, own a copy of Tom Clancy's Splinter Cell: Conviction, or have a PlayStation Plus membership. Some selected users from Uplay were also able to enter the closed beta. No PC multiplayer date was ever set. Richard Machowicz, one of the hosts of Deadliest Warrior and the host for Future Weapons, hosted a three-part miniseries titled Believe in Ghosts. Here Machowicz looks at elements in the game and compares them to real life operations performed by special forces. In the short live action movie Ghost Recon: Alpha, which is a prequel to the game, a Ghost team (consisting of Pepper, 30k, Chuck, and an unnamed Ghost Leader) was trying to secure a RSM-56 Bulava nuclear warhead. While trying to disarm the warhead, Chuck was shot in the head. Eventually the remaining Ghosts managed to fight off the attacking force, but the warhead was airlifted by a helicopter belonging to an unknown faction. The short movie ends with a view of London set in the time period of the video game. Tom Clancy's Ghost Recon: Future Soldier received generally positive reviews from critics. Some reviewers, like IGN's, have praised the game's more thoughtful approach to cover-based shooting, scoring the game an 8.5 out of 10. GameSpot gave the game a 7.5 praising the lengthy campaign and multiplayer but criticizing the AI and combat. However, other sites such as Eurogamer Italy, Giant Bomb, Strategy Informer, and Cheat Code Central criticized Future Soldier for the streamlining and/or complete removal of many tactical shooter mechanics leaving many critics questioning whether or not it should even be considered a tactical shooter. The PC version suffered from lower ratings. Numerous bugs making the game unplayable, such as the interface ignoring keyboard and mouse inputs, were present in the game at launch. Ghost Recon Future Soldier on PC had huge issues with online PvP multiplayer due to peer-to-peer system that hosted games on people's computers instead of dedicated/cloud servers. Also, the game was locked at 60 fov as well as 60 fps. ^ Additional development by Ubisoft Annecy, Ubisoft Montpellier, and Ubisoft Singapore. Microsoft Windows port developed by Ubisoft Kiev. ^ "Ghost Recon Future Soldier slips to June for PC, includes DX11". New Game Network. April 3, 2012. Retrieved April 3, 2012. ^ "PC version confirmed for June 14th in the UK". Ubisoft. April 3, 2012. Archived from the original on June 18, 2012. Retrieved April 3, 2012. ^ "The PC version is coming on June 29th in UK". Ubisoft. June 6, 2012. Retrieved June 8, 2012. ^ Gilbert, Ben (January 10, 2012). "Ghost Recon: Future Soldier launch delayed to May 22 in NA, May 24 in EU; PC version totally exists". Joystiq. Retrieved January 10, 2012. ^ a b Ryan, Geddes (January 22, 2009). "IGN: New Ghost Recon, Assassin's Creed 2 Coming". IGN. Retrieved October 11, 2009. ^ "Diverse Environments at a Glance!". Ghost Recon. Archived from the original on March 6, 2012. Retrieved February 23, 2012. ^ a b Gallegos, Anthony (June 16, 2010). "E3 2010: Ghost Recon Future Soldier Updated Impressions". IGN. Retrieved July 1, 2010. ^ Gallegos, Anthony (June 22, 2010). "Ghost Recon Future Soldier Does Three Things Almost All At Once". Kotaku. Retrieved July 1, 2010. ^ "GameStar: Ghost Recon: Future Soldier. "It's a Special Forces experience"". October 24, 2011. Retrieved September 30, 2011. ^ de Matos, Xav (June 17, 2010). "Preview: Ghost Recon Future Soldier". Joystiq. Retrieved July 1, 2010. ^ a b Woods, Eric. "Ghost Recon: Future Soldier Impressions". Retrieved May 11, 2012. ^ "Gunsmith Walkthrough". GameTrailers.com. Retrieved February 28, 2012. ^ Asfahani, Tamer (June 21, 2010). "Control Drones In Ghost Recon: Future Soldier". IncGamers. Retrieved July 1, 2010. ^ "Inside Recon No. 2 – Overview of Ghost Recon Future Soldier technology". UbiSoft. Retrieved March 13, 2012. ^ "Ghost Recon Future Soldier". Red Storm Entertainment. Retrieved May 12, 2012. ^ Reilly, Jim (December 21, 2009). "Ubisoft Registers 'Ghost Recon Future Soldier'". IGN. Retrieved December 27, 2009. ^ Plunkett, Luke (February 9, 2010). "Ubisoft Unveils New Ghost Recon Title". Kotaku. Retrieved February 8, 2010. ^ "Ubisoft reports first-quarter 2009–10 sales" (PDF). ubisoftgroup.com. Ubisoft. July 27, 2009. Retrieved October 11, 2009. ^ McWhertor, Michael (May 19, 2010). "Ghost Recon: Future Soldier Stays Cloaked Until 2011". Kotaku. Retrieved May 19, 2010. ^ Alexander, Leigh (November 15, 2010). "Ubisoft's Guillemot Talks Driver Delay, Studio Restructuring". Gamasutra. Retrieved November 16, 2010. ^ "Ubisoft reports first-half 2010–11 results" (PDF) (Press release). Ubisoft. November 15, 2010. Retrieved November 16, 2010. ^ "Ghost Recon: Future Soldier on PC replaced by Ghost Recon Online". Joystiq. November 25, 2011. Retrieved December 13, 2011. ^ "No Ghost Recon: Future Soldier on PC". Eurogamer. November 24, 2011. Retrieved January 7, 2012. ^ "Tom Clancy's Ghost Recon: Future Soldier for Xbox 360 - GameRankings". Retrieved November 30, 2012. ^ "Tom Clancy's Ghost Recon: Future Soldier for PlayStation 3 - GameRankings". Retrieved November 30, 2012. ^ "Tom Clancy's Ghost Recon: Future Soldier for PC - GameRankings". Retrieved November 30, 2012. ^ "Tom Clancy's Ghost Recon: Future Soldier for Xbox 360 Reviews, Ratings, Credits, and More - Metacritic". Archived from the original on October 27, 2010. Retrieved November 30, 2012. 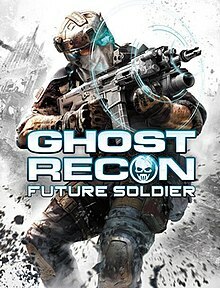 ^ "Tom Clancy's Ghost Recon: Future Soldier for PlayStation 3 Reviews, Ratings, Credits, and More - Metacritic". Archived from the original on October 27, 2010. Retrieved November 30, 2012. ^ "Tom Clancy's Ghost Recon: Future Soldier for PC Reviews, Ratings, Credits, and More - Metacritic". Archived from the original on October 27, 2010. Retrieved November 30, 2012. ^ a b Watters, Chris (May 22, 2012). "Tom Clancy's Ghost Recon: Future Soldier Review". GameSpot. Retrieved October 11, 2013. ^ a b Simmons, Alex (May 22, 2012). "Tom Clancy's Ghost Recon: Future Soldier Review". IGN. Retrieved October 11, 2013. ^ Yoon, Andrew (June 27, 2012). "Ghost Recon: Future Soldier PC launches with serious bugs". Shacknews. www.shacknews.com. Retrieved June 28, 2012. ^ Sharkey, Mike (June 27, 2012). "GameSpy: Buggy PC Launch for Ghost Recon: Future Soldier". GameSpy. Retrieved June 28, 2012. This page was last edited on 6 April 2019, at 03:38 (UTC).